You might think this is a strange recipe. After all, why on earth would anyone feel the need to share how they make scrambled eggs? Truth: these are nothing like “regular” scrambled eggs. These eggs are creamy, decadent and luscious. These, my friends, are slow scrambled. 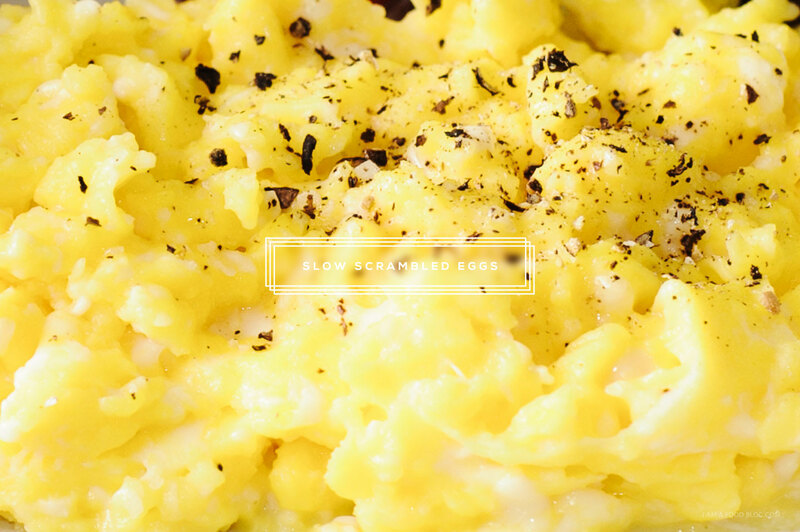 You need slow scrambled eggs in your life. Take the time to stand by the stove and stir, stir, stir. 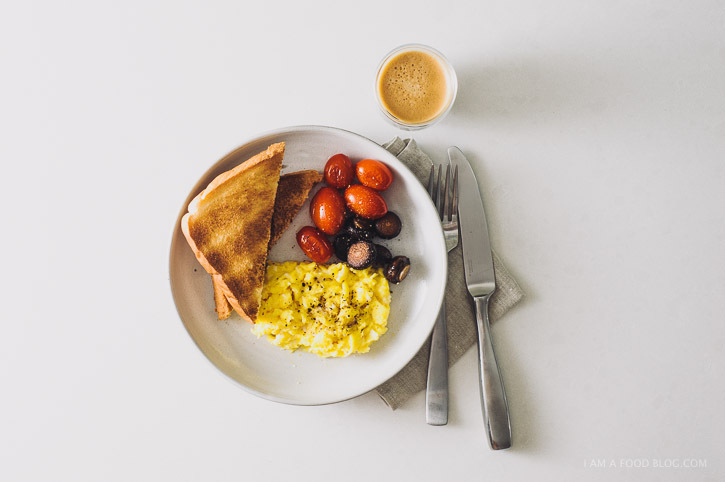 Contemplate how fast time goes by these days and slow down with a simple home cooked breakfast (or lunch, or dinner!) of eggs and toast. Slow scrambling the eggs and stirring constantly gives the eggs a super-creamy, custard-like texture. Honestly, even thought it takes a bit more time, this is the only way I scramble. How do you guys like your eggs? Break your eggs into a small bowl or glass measuring cup. Beat throughly, until the whites and yolks are uniform and incorporated. 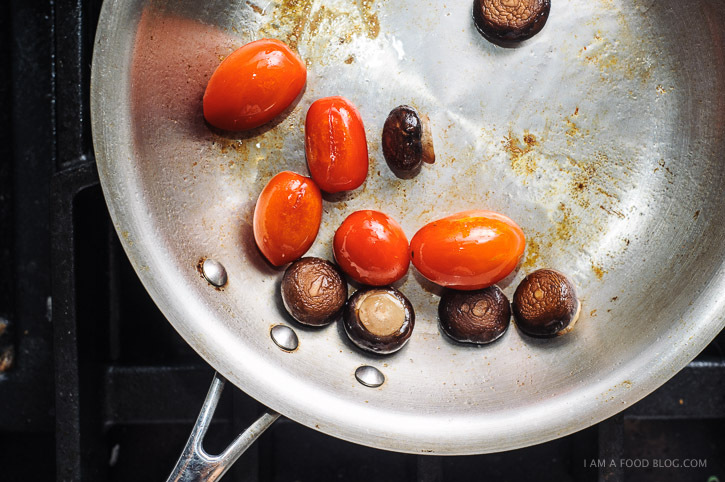 Heat up a small, heavy-bottomed saucepan on low heat. (I like to use a non-stick pan. Add the butter and melt over low heat. Add your eggs. Usually, when you add eggs to a pan there’s a sizzle when the eggs hit the heat. You DO NOT want any sizzle whatsoever. It will almost be like you’re adding eggs to a cold pan. With a heat-proof spatula, stir your eggs. It doesn’t need to be constantly, but if you have the time, stir, stir, stir. Eventually, the low heat will start to create tiny, tiny curds – the tiny curds are what make these scrambled eggs so creamy. Keep stirring and scraping the pan with your spatula until all of the eggs are barely set and custardy. Take the pan immediately off the heat, plate and enjoy with plenty of salt and freshly cracked pepper. 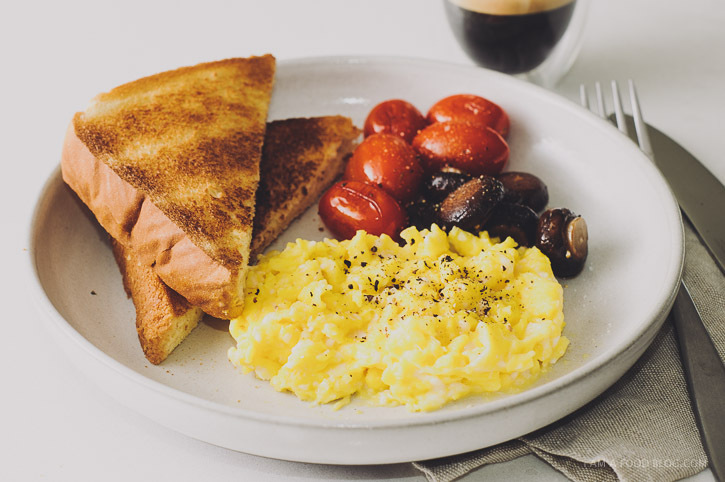 Scrambled eggs are my life recently – I need to sloooooow it down! There’s nothing worse than bad scrambled eggs – like you get at most hotels, no matter how many stars it has. What I find interesting is that you don’t use any cream in this recipe. I always measure 1 tbsp cream per egg. Have to make this recipe for breakfast tomorrow! sometimes, if i have cream on hand i’ll use it, but they really don’t need it if you stick to the low-low heat. Made it and yes, it was super-duber creamy. Ooh, I’m glad you liked them! I make these sometimes, when I have the time and patience to do them right, and they are truly awesome, worth the extra effort. I always add some extra fat whisked in with the eggs, usually some marscapone or heavy cream, and a dollop of whole grain mustard. I’ll sometimes finish it with a few drops of truffle oil, very decadant and delicious! Slow is the key, the whole cooking process should take about 15-20 minutes. Yes! The long, slow scramble really transforms eggs, doesn’t it? I don’t often have the patience for it (and honestly there is a fair preference for migas instead of plain scramble in our house), but when I do? SO good. totally transformative! i haven’t had migas before, but i just googled it and it sounds delicious! I used to not be so keen on eggs cooked like this but I am definitely coming round to the idea of slow-cooked scrambled eggs. They taste especially good with some smoked salmon and English muffins! mmm, english muffins and smoked salmon with slow scrambled eggs sounds delicious! that’s so sweet. i love it when food is nostalgic! Oh gosh, after seeing Gordon Ramsay do eggs this way once I always try to make time to do my scrambled eggs this way! Thanks for reminding me (I am more poached/soft-boiled eggs these days) to do them again! I made them once for my paleo friends for breakfast, forgetting that she hates “wet” eggs, but I think I may have made a convert out of her since they are in fact nearly completely cooked. Thumbs up to the side of thick toast and sauteed veg! This is my preferred method as well–except that I whisk salt into the eggs. I like salty eggs. But there is another technique that’s worth playing around with: when you whisk the eggs (and salt, and maybe some cream), do so in the stainless steel milk steamer that came with your espresso machine. Then steam the eggs like you’re making a latte. Sounds like a chemistry experiment, but two things happen: first, all the steam makes the eggs incredibly light and fluffy and increases their volume; second, because the scramble is being heated uniformly, the entire mass goes from liquid to solid in about three seconds–at precisely the perfect temperature. I agree, cooking eggs over low heat, even fried eggs, is usually best. 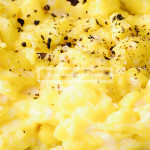 Sometimes, however, I make scrambled eggs in the microwave, using a broad, squat dish, such as an individual pasta bowl. Microwave a tablespoon of butter in the bowl. Swirl the melted butter all around the bowl. Add 4 beaten eggs to the bowl. Microwave the eggs 60-90 seconds (90 works for me in my 1000-watt microwave). Stir the eggs well with a fork. Keeping a close eye on the process, continue microwaving/stirring action at 30-second intervals until eggs appear just shy of the way you like them. By the time they hit your plate, they should be nigh on to perfect. Salt and pepper finish the deal. hope you get a chance to try out this method!! Ah. You have discovered my secret. I have made this recipe a number of times, modifying it with shredded cheese. I did so well the first time, copying the process from an episode of Nero Wolfe, that my wife left the work to me from then on. It is my family’s favorite breakfast dish…and one of the few I can cook from scratch. It is ESSENTIAL that you NOT over heat the pan!! Mine take more than 20 minutes…in the Nero Wolfe episode, Nero took 40 minutes to cook his! They ARE absolutely GLORIOUS!! Slow scrambled is indeed the ONLY way to do it. You should try the bain-marie method (French for ‘water bath’). Basically follow this recipe but put the butter and eggs in a double boiler instead of a pan. Even creamier. Sometimes I’ll set me eggs in cheesecloth or fine strainer after to drain some of the liquid so they are perfect but not wet.